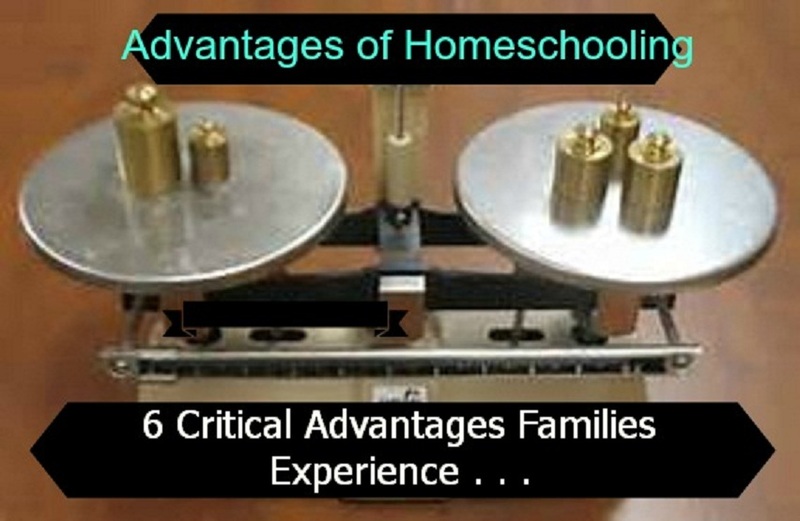 Although most homeschoolers know the advantage of homeschooling, they are worth mentioning if you are thinking about homeschooling or wondering whether there really are advantages. You get to spend time with some of the greatest kids you'll ever know. Ask any parent of a teenager and they will tell you how time has flown by since their child was born. With homeschooling you get to spend lots of time interacting, coaching and forming a relationship with this child of yours. You get to see the light bulb moments when your child learns something and the light bulb goes off in their eyes showing you that they "get it." Teachers love these moments. Sometimes it is the only thing that keeps them going. It's so rewarding to work with a child and help them understand something about the world around them. One on one tutoring - If your child was in public school and they told you that they would receive one on one tutoring for even half of the day, you would be thrilled. We all know that one on one instruction is very effective and beneficial for the child. With homeschooling you get to take full advantage of giving your child individual time and instruction. You can help your child develop good social skills. They will have less exposure to bullying, swearing, bad grammar, and bad manners. You can work with them little by little on how to treat other people and how to speak properly without having to deal with them hearing something different than what you are teaching them yourself. Religious education - although there are some non-religious homeschoolers out there, many families choose to homeschool so that they can provide their children with Bible training and knowledge. You have control of the curriculums and resources that your child uses. If you start using a certain books or homeschool curriculums and find that it becomes completely frustrating or too difficult for your child, you have the option of modifying the resources or choosing something else. In the same regard if your child is understanding the material and tests out of a book or resource, then you are free to move on to some more challenging material instead of making your child plod through material he already understands. Here is a list compiled by another homeschool mom of the Top Reasons to Homeschool. It's fun when you can look at each advantage of homeschooling and realize that you are being used to help mold and shape a little life. When you focus on the advantage of homeschooling, you can overcome those days when you feel like you should give up. Homeschooling is worth the extra effort and time that a parent needs to be able to homeschool successfully.